Recently I completed work on adding single sign-on functionality to our Blackboard Learn environments by integrating the login with our CAS server. To understand how this works, you first need a basic understanding of the authentication architecture that was being used prior to adding CAS to the mix. Our environment provides users with two primary methods of authenticating to services on our network. One method is via a username/password, where the username is some representation of the users name (usually the first part of their email address). The other method is via a unique userid/pin, where the userid is a unique nine digit number. Our Bb Learn environment has traditionally used the userid/pin credential set, whereas the CAS server is tied to the username/password credential set – so integrating the two provided a little less straightforward that it might otherwise have been. Our users are imported to our Learn environment via XML imports from our SIS, using the IMS Enterprise 1.1 – Vista XML format. Both user identifiers are included in the XML that is exported from the SIS, but the challenge was always how to tell Blackboard that either method of user authentication would be acceptable. By adding CAS as an available authentication method, I didn’t want to – at the same time – invalidate the way that users had traditionally been able to login to the system. The key to making authentication work both with the traditional userid/PIN authentication (directly imported from the SIS) while also allowing our CAS server to perform user lookups on the username method of authentication, was in the Advanced Configuration field mapping of the Users data type in the Student Information Systems Data Integration section of the Learn admin. There are a few steps that you’ll need to take to make this work – and all of these steps assume that you’ve already got a CAS server deployed that has been tested and is working. I am also assuming that you’ve already added the Blackboard Learn system that you’re adding CAS to as a valid service URL in the deployerConfigContext.xml of your CAS server. These steps are outside the scope of this article, but if you’re trying to make this work and can’t, leave a comment and I’ll try to assist. Set the provider to “Active”, and make sure to choose “Batch UID” as the user lookup method. 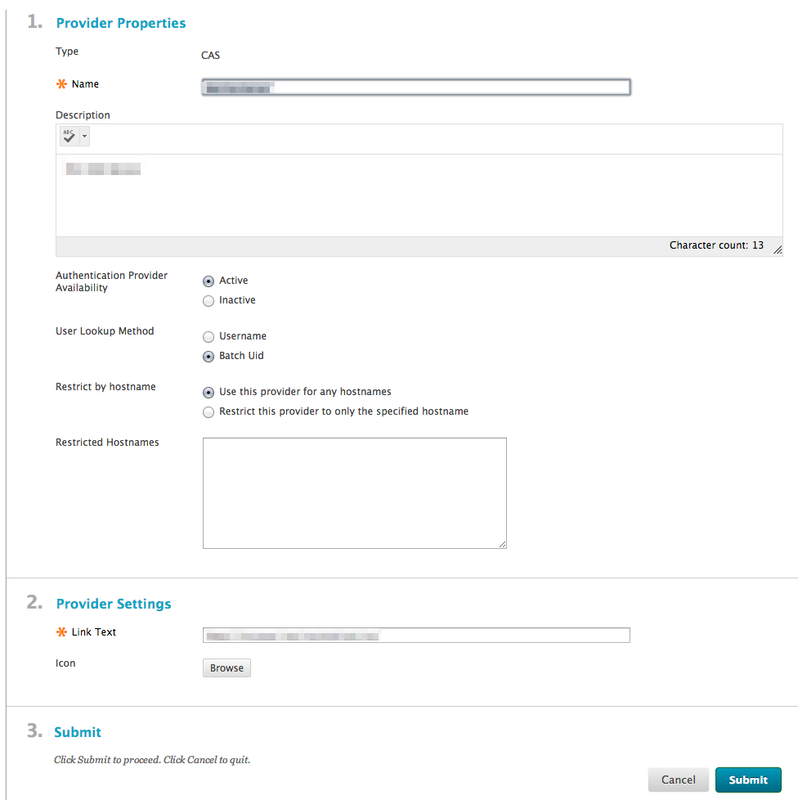 This allows CAS to be provided as an authentication option without requiring that you change the value that you’re already using for your primary user lookup. After clicking “Submit”, you’ll see the server listed as an available authentication provider in your Learn admin. Click the small down arrow next to the name of this provider, and choose “CAS Settings” from the context menu that appears. These settings are self-explanatory. All you really need to provide by way of CAS settings are your server URL, and the URL of your logout servlet. Once this is done, we can move on to configuring your integration to allow CAS to lookup your users. Visit the “Student Information System Integrations” section of your admin. Find the SIS integration that you’re currently using with your system, and click the down arrow next to it, choosing “Advanced Configuration” from the drop down menu that appears. You’ll be taken to a screen that lists the various Learn object types that you can configure. Each object type allows you to provide your own field mapping definitions that match the Learn object value attributes to the XML that you’re pulling from your SIS. Find the “Users” object type, and click the small arrow next to the name, choose “Field Mapping” from the context menu that appears. By default, the field “Change on Update” for the element “Replacement Batch UID” should not be checked. Go ahead and check this value. This is going to allow you to provide a new value pulled from the XML that will serve as your Batch UID that CAS will use to match your user that is attempting to login. In the last step, when setting up CAS as an authentication type, we told the authentication provider to use the Batch UID as our lookup mechanism rather than the default Learn username value. In this way, we allow either the new “CAS” username to work for authentication, or the traditional username scheme we were already using in the Learn environment. Because our source SIS is also a bit inconsistent about how the email address is entered, I am also including a preemptive bit of script to make sure that all usernames are imported in to the system using similar casing. Once this value is included as a secondary id for all the users I am importing from the SIS, the users should then be able to login using either their traditional userid, or using their username via the CAS system.